Developer Quote: "Finally real sailing regatta on iPhone and iPod, ONE and ONLY MULTIPLAYER sailing game." ..UPDATED: 10/21/10, VERSION: 1.6 -- RATING: 3 Stars.. If you've never skippered a boat before, don't worry! This game provides maximum sailboat entertainment whether you are a novice boater or a seasoned captain. 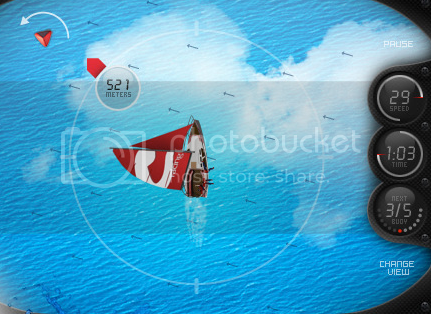 Brilliant graphics and smooth controls let you hone to perfection your sailing skills. COOL CONCLUSION: Caribbean Racing Sailing multiplayer is the perfect tropical app for those who are stuck inland, and can't get out on the high seas. --OS and Age Rating: This app requires iOS 3.0. iOS 4.0 Tested. Rated 4+.